1.1 Take the wire cutters, and cut the white 568B patch cable in half. Then take the wire (or possibly an internal string) and pull it such that it rips though the side of the plastic sheathing. This will ensure that any nicks on the cable made by cutting the cable are far from the connectors on the socket that you attach later on. 1.2 Cut away the excess sheathing on the wire. 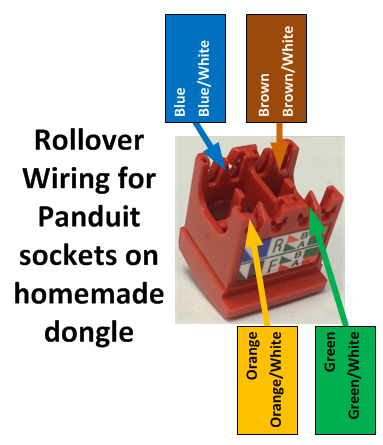 2.1 Since we are wiring a roll-over RS-232 dongle, ignore the labels on the side of the jack, and use the following guide for where the colored cables go. 2.2 DON'T unravel the wrapped color, instead push the four colored pairs of wires into one of the four quadrants of the jack. 2.3 Push the cable as far in to the jack as you can, and then fasten the lock (or anchor) down to secure the cable. 2.4 Slightly untwist the bottom of the cables enough so that you can separate the pairs enough to both fit in their own groves in the jacks. Note that the white-most wire goes to the left slot, if the jacks tab and label is facing you. 2.5 Do this for all the cables. Notice how only the bottom of the wires were untwisted, but the rest is still wrapped up. 3.2 And then cut off the extra cables. 3.3 Be careful when taking the jack out of the tool. The cables are gently held into place, and can be dislodged if you are rough with it. 4.1 Put the receptacle side of the jack together with the component you were working with, such that the tab fits in with the locking divot. 4.2 Make sure that the stopper on the termination tool is set such that the longer end is toward the front of the gun. 4.3 Then put the two parts of the jack in the front of the gun and lock the components together. 4.4 Make sure that you get the two components together tightly. 4.5 Finally, mark the jack so that you know that it is a roll-over adapter. The circular arrow (that kind of looks like a G) is what I use to denote this.